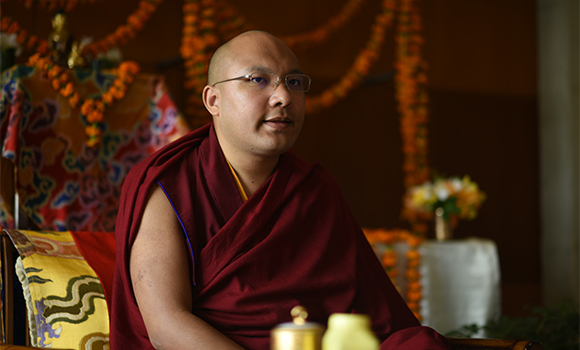 The recent teachings given by the Gyalwang Karmapa in New Delhi focused on the deity known as Akshobhya or Mitrukpa in Tibetan (the Undisturbed). On the first two days, the Karmapa introduced the practice lineage of Akshobhya and told the history of how he became fully awakened. On the third day, he bestowed the empowerment. There were also opportunities for question and answers. When all the monks heard this, they were greatly inspired and filled with joy. The monk who was to become Akshobhya then made a vow, saying, “From today onward until reaching buddhahood, I will never hate for any living being.” This was the first of the eight great aspirations that the monk made and the critical one that led to his full awakening. The Karmapa suggested that in reflecting on this vow, we could discover how brave Akshobhya was. Why? Ordinary people like us have no idea about where we will we go in our next life, and we are even not sure about what will happen during the future of this life. So it could he, he said, that we might not have the courage to make the vow of avoiding hatred in our lifetime. This is really difficult to do, but we are followers of the Buddha so we need to try. We can begin with a short period of time, such as three hours, and then extend it to three days, three months, three years, and onward. Generally in Buddhism, the Karmapa commented, the meaning of the word angry is slightly different from that of the word hatred. Anger is a temporary impulse, while hatred is more pervasive, going deep into our hearts and down to our bones. Therefore, we should learn to be like Akshobhya and practice in stages, going step by step. Just saying that we will not hate, however, is not enough, the Karmapa instructed. We need to find persuasive reasons and effective ways to work with hatred so that eventually it will be completely dispelled. And these reasons cannot just come from books or our teachers: we have to look clearly within and persuade ourselves. The Karmapa spoke of how to challenge ourselves but without too much pressure: we can practice like a child playing. He also suggested focusing on patience (or forbearance), the traditional remedy for anger. Usually patience is understood in three aspects: patience with someone who harms you; patience that can endure suffering; and patience that does not fear the profound truth of the Dharma. The first type could refer to situations that we feel are unjust or that aggrieve us. When this happens, we should be patient. We can first observe “the enemy” who has harmed us and see if they are able to control their emotions, or the emotions control them. If they are taken over by their emotions and very anxious, for example, then it is the emotions that caused the harm, not the person, so we do not need to be upset with them. These days thee are many terrorists in the world but they were not born terrorists. What made them terrorists is their environment. Therefore, this is a temporary situation, such as clouds covering the sun, and for this you cannot blame the sun. We should develop a deeper understanding of these temporary situations and not make judgments based merely on the appearance of things. 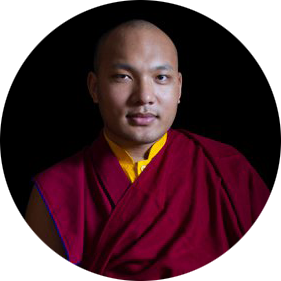 The Karmapa clarified that in these difficult times, the reason for holding ceremonies, retreats, and pujas is that human beings have created considerable negative karma through the misuse of technology, science, and economics. And our strength is beyond our imagination—we already have the power to destroy the planet, but do not realize it. The practice of Akshobhya is the best and most precious way to purify this negative karma. Speaking of the bodhisattva vow, the Karmapa described the two types of bodhichitta—aspiring (wishing to help) and engaged (the actual activity) —and summarized the vow itself as never giving up on any living being. The most important, he said, is that we have to take action, not just make a wish. And when we are engaged in activity, we must maintain a positive state of mind, never losing confidence in ourselves. In being patient and persevering when facing this complex and dark world, we will build up our strength and increase our capacity to benefit others. Question: I’m a disciple of the 4th Jamgon Kongtrul Rinpoche. In this current situation (of his having left the monastery), how should I continue my practice with faith? The Karmapa answers: How should I put this, it is neither good or bad in the way some people are thinking about it. I was the most affected when this happened, as most of you know. After I observed everything, I was not too worried about it. To be honest, sometimes I feel that I see him in a different way than others, because I have sympathy for him. Since I have been there before as a human being, I understand and do sympathize. But I don’t think we should lose our faith just because Rinpoche has made his choice. It’s not necessary to lose faith. Mainly I wish that he does not give up on living beings and the lineage, for with this everything will be all right. This is my main wish. It is up to Rinpoche to make the decision as to how is he will accomplish this. Don’t pay too much attention to how you feel or think about things right now, imagining that they have to be one way or another. I do not do that and feel that you should not either. Especially since a bodhisattva has different ways to benefit living beings, and the most important thing is that he has the intention and will to be a bodhisattva and to benefit living beings. If he has this, then nothing else is of much concern. This is my personal thought and attitude toward Rinpoche. On the other hand, he is a lineage master and an incarnation of Jamgon Kongtrul Rinpoche. For the lineage it’s a massive loss, though one cannot really say it is massive loss since we do not know what is going to happen in the future. In the short term, however, it is a huge loss especially to Rinpoche’s monastery, since they did not expect this at all. As you all know, the 3rd Jamgon Rinpoche passed away at a very young age, and now this 4th Jamgon Rinpoche has left them at a young age, too, so they are suffering greatly in their hearts. We all should understand this. If you have the ability, please help them as much as you can. This is more important. I can see clearly that all the staff around him has tried to do their best; they could not have done better. That is why at times I blamed myself for not taking better care of Rinpoche, and if I blame myself, maybe it will be a bit better for them. Question: How to tell if we are making progress in improving our practice? The Karmapa answers: When we say that we want to find inner peace and so on, we are often imaging something like receiving a very comforting mental massage to make us happy and relaxed. But actually, practice comes in challenging stages like the training in an army. At times practice can be more painful than having a major operation or replacing all your bones, so if you are feeling joyful and wonderful, maybe you are not practicing very well. At other times, just when you feel practice is very difficult and painful, real change is happening in your mind. Question: How should we set up a shrine in our homes? The Karmapa answers: I’ve always wanted to talk about this subject as many people have asked me how to arrange a shrine. Some people believe in traditional Chinese Mahayana and some people believe in Tibetan Buddhism, and so in this case, you need to be aware of the different images when you set up a shrine. It is not good to create conflict or have argument over this. These days it is easy to find images of numerous vajrayana deities but we need to be careful, he said. For example, the protector deities are confidential and we are not allowed to exhibit them to everyone. Showing them like an advertisement violates the principles of the vajrayana. This is also true for anuttara yoga deities, which should not be displayed to just anybody. If we want to set up a shrine, we can place on it images of famous deities, such as Shakyamuni Buddha, Amitabha, Avalokiteshvara, Guru Rinpoche, Tara, Bhaisajyaguru (Medicine Buddha), and Akshobhya. These are all widely recognized and simple. But if we are engaged in a special deity practice, it is better to place the image inside our text or resting on the text holder. We also need to pay attention to our teacher’s photo. If you have my photo, please do not place it in the shrine along with images of bodhisattvas. The same is true for other teachers. If you want to have an image of a teacher, then please place the image on a wall nearby. It is not appropriate to place it in the middle of the shrine or mix it with replicas of bodhisattvas. There are different types of teachers (lamas or gurus): some of them are enlightened and some are not, but they still can be qualified teachers. If you place a photo of teachers who are not enlightened mixed but in with images of bodhisattvas, it is not good for the teachers, even though we may see them as being the Buddha. To illustrate his point, the Karmapa related the story of Maudgalyayana, who along with Shariputra was one of the two most famous disciples of the Buddha. Maudgalyayana possessed the six types of higher cognitions, which, among other things, allowed him to move around freely. One time he went to the hell realms and saw an Indian master who had been reborn there. This master pleaded with him to take a message to his disciples. They had built a stupa containing the master’s bones and many people were circumambulating it, which caused the master great agony, and so he was requesting them to stop. When Maudgalyayana delivered the master’s massage to the disciples, they became incensed: “You do not even know our great master and just want to insult him.” They beat him half dead and not long after that he passed away. How could some one with psychic powers like those of Maudgalyayana end up like this? He remembered that he had beaten someone to death in a past life, creating that same negative karma in this present life. We can see, therefore, that no matter how excellent his psychic power might be, it could never be more powerful than his karma. For these reasons, I feel it is better not to place a guru’s photo or name, or for that matter, the names of sponsors, on the shrines. These are not appropriate. Please pay attention when placing photos and images of tantric deities on the shrine as well. Just as in the Refugee Tree, there are rules about how to place deities in the right order—the Buddha, Dharma, Sangha, guru, yidam deities, dakinis and protectors. Although all beings are equal, in appearance they need to take their proper places. Of course, when we are arranging our shrine, it is not always possible to consult our teacher, so we need a basic knowledge, a sense of how things should go. Unless your teacher instructed you otherwise, it is safer to place guru’s image on the side. On the last day of the teachings, the Karmapa kindly bestowed the empowerment of Akshobhya on the fortunate students who attended the teachings, spending these three precious days in the presence of the Karmapa.